Over a recent lunch with some friends from CRBC we were discussing the dilemma as to what Reformed believers should do with Christmas. On one hand, we do not want to celebrate an unbiblical “holiday” but to keep our focus on the Lord’s Day as our only biblically sanctioned festival. On the other hand, we want to enjoy the positive aspects of the season as a cultural celebration. We, therefore, decided that we should institute an alternative Reformed celebration that we have dubbed “Ranzaa” (Reformed Kwanzaa). 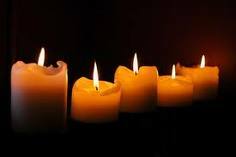 At Ranzaa time (Monday-Friday the week of the winter solstice, and never on Sunday) each Reformed family would set up five candles (representing the five points of Calvinism). Each night a new candle would be lit and the parents would teach the children about an individual aspect of the doctrines of grace (Children, tonight we light the total depravity candle….) and offer a biography of one of the Reformers (Children, tonight we learn about Melanchthon…). Other suggested activities would include exchanging Reformed commentaries or Puritan paperbacks with family and friends, catechism quizzing with the kids, giving bouquets of tulips to the ladies, and Ranzaa caroling (“A Might Fortress is our God,” “How Sad our State by Nature Is,” etc.). We think this could catch on…. This is a good one. I may have to institute this here in Culpeper at Truth and Way. Here's just another example of how you cavinist think you are soooo superior to regular Christians, whats next, calling the "x-mas" tree Druid idolatry. Clearly B. Overstreet has a superlative sense of irony.